So, you may remember I received some pretty funky cookbooks for my birthday last month. I'm still deciding what to cook first from the Japanese ones - it's all just too pretty! - but there was no such indecision when it came to David Lebovitz' new one, Ready for Dessert. I haven't even read all of the book yet, but I knew that his chocolate chip cookies would have to be first thing I made. (Although technically these are second recipe I've made - I made his cheesecake brownies last year in July after he published the recipe on his blog). He's also posted up a cute video where he makes these cookies, and feeds them to unsuspecting Parisians, who, surprise surprise, think they're fabulous. His cookies are quite similar to The Rock's chocolate chip cookies (minus the oats), and my favourite chocolate chip cookies. David does have a few tips though, to make his cookies extra-special. 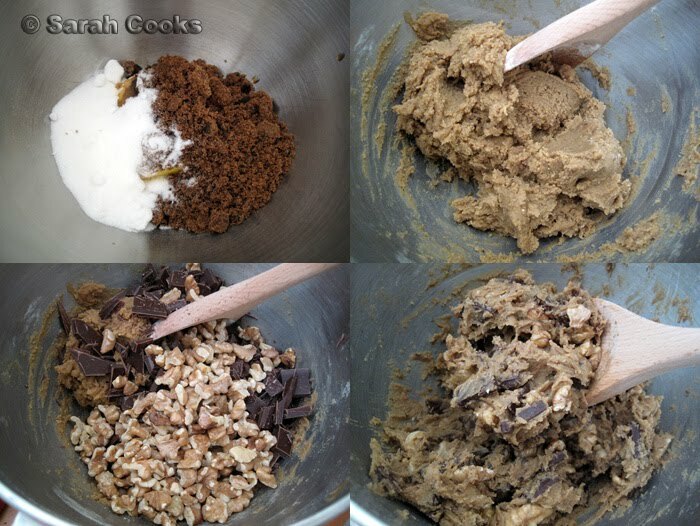 He suggests that you don't overmix the butter and sugars, so that the mixture doesn't become aerated, as this will make the cookies spread when you bake them! The recipe calls for a mix of white and light brown sugars. I didn't have any light brown sugar, so I substituted a rich dark muscovado sugar. 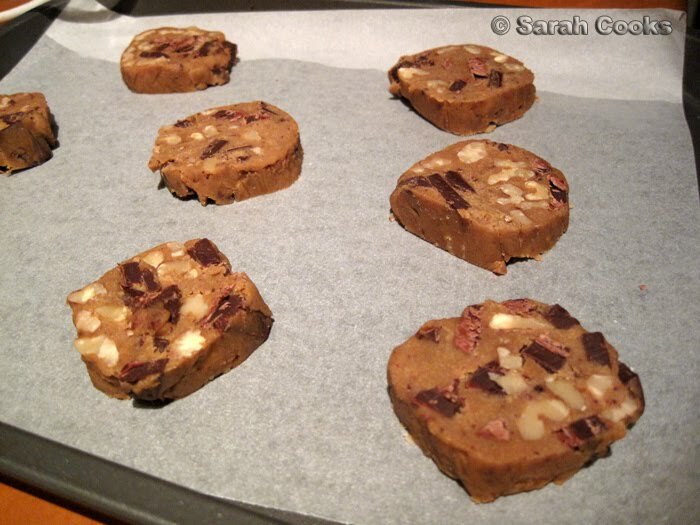 He also suggests using a chopped bar of chocolate instead of chocolate chips. Chips are designed to hold their shape, and chopped chocolate will give you more melty goodness. I used a couple of bars of Lindt Excellence 50% cocoa dark chocolate. I quite like the 50% dark chocolate - it gives intensity without harsh bitterness. Finally, the dough should rest for 24-hours in the fridge. Unfortunately, I did not have the patience for a whole 24 hours - I just left the dough in the fridge for a couple of hours until it was firm enough to slice. They only take about 9 minutes to bake, at whcih time they will be golden brown and smelling delicious! They were quite soft on the tray, but firmed up as they cooled down. From the below photo, I can see that the cookies did spread a little, but not too much. These were a-mazing! They're soft and chewy like a Mrs. Fields cookie, with a slight crunch around the edges. 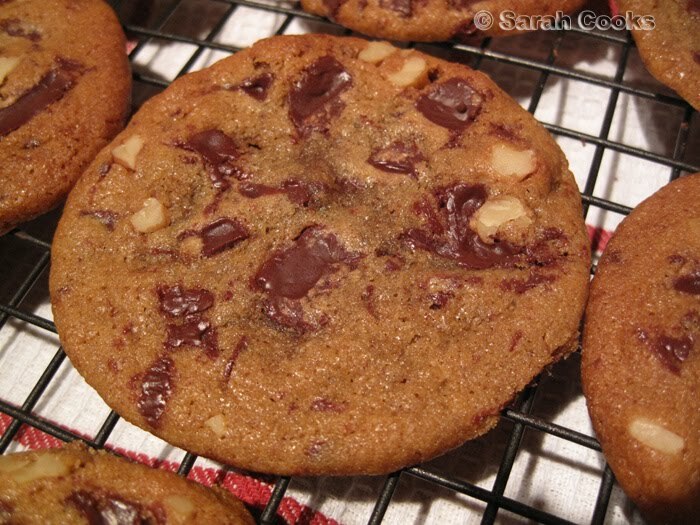 I was worried the dark muscovado sugar might be a little too dark, but it gave the cookies a wonderful caramelly flavour that complimented the walnuts perfectly. (You know, like that maple walnut flavour combo). I also loved how melty the chocolate was. Very decadent. I ate an insane amount the day I baked them, but after that common sense took over and we packed the rest up to take to work. 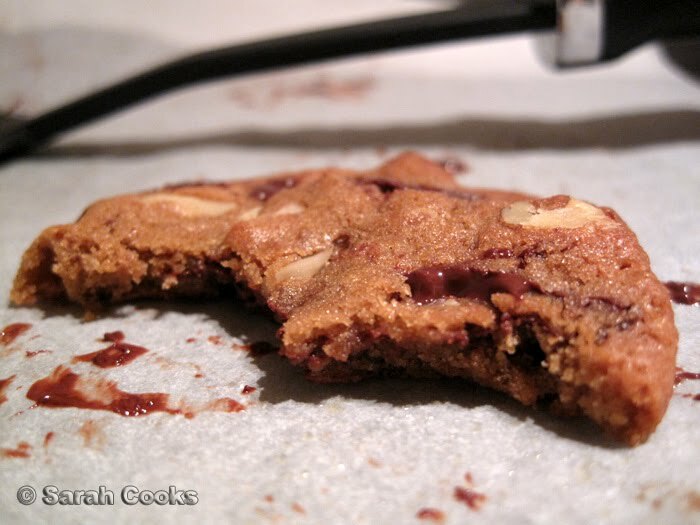 These will definitely be my go-to basic choc-chip cookie recipe from now on. Ooh, melty choc-chip cookies! Great tip on how to stop them spreading. Great looking biscuits. 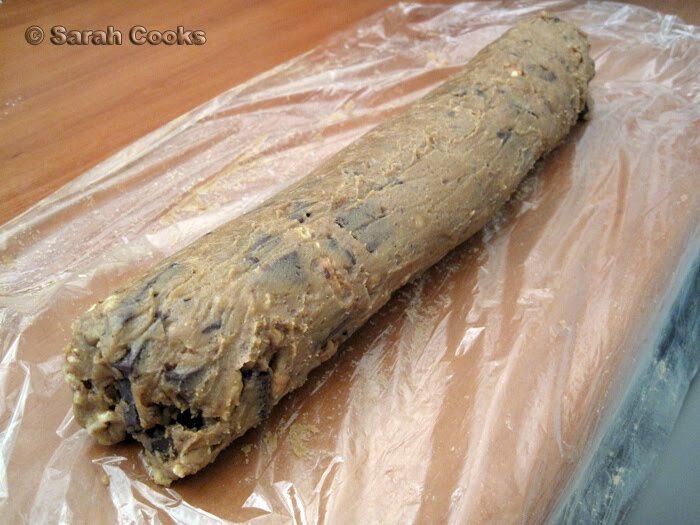 I love the massive roll of cookie dough. I would struggle not to eat it raw. omfg these look delicious! and i am full to the brim with gelati so it must be true!! i want to go to there. I too just got his book, but wasn't a present :( I was going to try the cookies this weekend but maybe I should just try it tonight..!! Oh. I am in love. And what a handy tip. Do not over beat! I always do that. That looks SO good! I'm such a David Lebovitz fangirl too. I think he's fantastic! I'm reading through The Sweet Life in Paris right now and enjoying it immensely! i saw this recipe on david's blog and ordered a copy of his book straight away. can't wait till it gets here because this recipe just looks so tasty! have you tried any of the other recipes? That book and those cookies are on my must-have list. I love that last picture with the melty chocolate - just wish I could reach out and take a bite! These cookies are amazing... I have a batch in the oven right now! The dough is pretty awesome (the toasted walnuts make all the difference) but if you can wait until the cookies are baked and cooled, you're in for an even bigger treat. If you can leave some around for the next day - they're even more tasty. I hope that everyone else enjoys them as much as I do! Can't go wrong with cookies like these! That's a really good tip about not overmixing the butter and sugar. I've tried out so many choc chip cookie recipes and I have a favourite one currently. However, I must try this one out too and see if it's that good.